Co-op play with your friends! 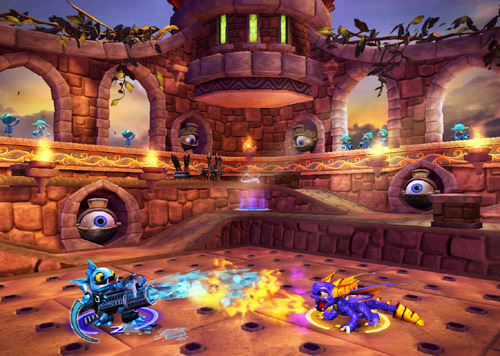 There are a few different ways you can play Skylanders Spyro's Adventure: single-player adventure, co-op player adventure or battle. Getting everything set up for this game is fairly easy. Their is a USB adapter that gets plugged into the back of your Wii console. This is how the Portal communicates with the Wii. The game will tell you when to place your figure(s) onto the Portal and once you do, you will instantly see that character appear in the game. You then control his actions and movement with your Wii controller and nunchuck. 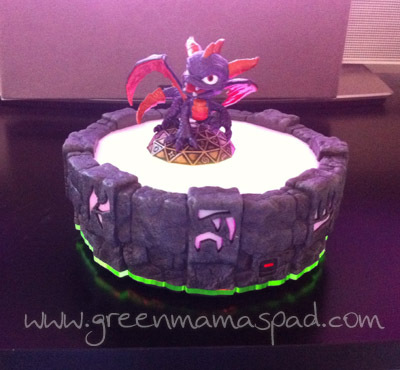 We decided to start off with Spyro because who doesn't love a cute, purple dragon? 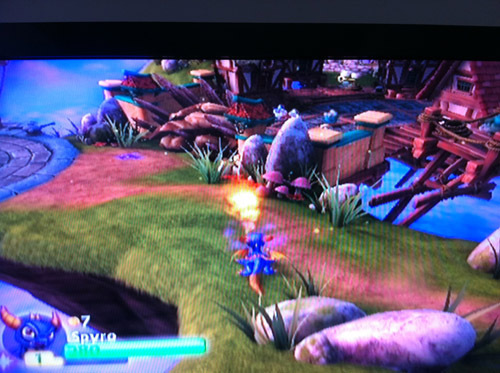 Spyro's first adventure with the Portal of Power. I found game play to be easy to learn. The nunchuck is used for directional moving and the controller for breathing fire and other actions. My six year old picked it up rather quickly. Definitely a lot of fun. Though it is rated 10+, I didn't have a problem letting my six year old play this and he loved it. I recommend it for the young gamer on your shopping list this holiday season. I plan on picking up some additional figures on Black Friday so my boys can really get into. OK, and for me as well. Rated: Everyone 10+ for cartoon violence. 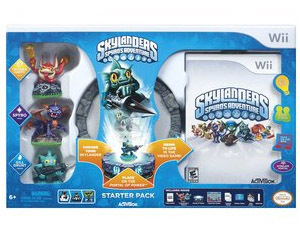 The Skylanders Spyro's Adventure Started Pack retails for $69.99. Additional figures are sold in single pack for $7.99 or 3-pack for $19.99. Available at major retailers like Target, Walmart and Toys R Us. The starter pack is on sale for $49.99 and single-pack figures are 2 for $10 at Toys R Us and ToysRUs.com. All figure packs are Buy 1 Get 1 Free at Toys R Us. Starter pack will be $49.99 at Walmart. 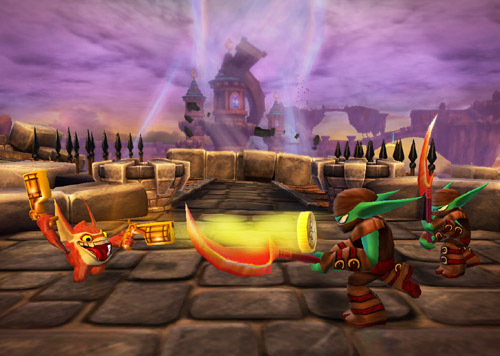 One lucky reader will receive the Skylanders Spyro's Adventure Starter Pack for the Nintendo Wii. Giveaway Ends 12/05/11 at 12:01 AM EST. Use Rafflecopter form below. This looks like a fun game my nephews would enjoy playing. The graphics are spectacular and the "Cross-Form Playability" makes it so versitile. It has to be a "winner." I love the graphics! Looks like a fun game my nephew would enjoy playing! I love that there are different ways to play too - single, 2 player, and battle. I seen this game in the store and I know my son would love it. I love how you can buy different characters in put those characters in the game. It looks like fun because the graphics are super. I know my nephew will love it! This looks like a game that would be easy for me to catch onto and play with the kids. It looks like the set up is easy and the levels are easy to move through. My son pointed this out to me the other day but now that I've watched the video on the website, I can see that this would be such an amazingly fun interactive adventure game! This would be so perfect for him!! I'd love to win this, thanks so much!! I would love to win this awesome giveaway My sons would love this game and have been asking for it for Christmas from Santa. My son loves imaginary play - this looks like a great hands-on way to do it!! Thanks so much for the chance to win!! I think that my son would have a blast and get some good hand eye coordination skills with this game! This looks like a fun game because it's Wii so you are actively involved, plus the graphics are cool. This game looks fun, because of all of the neat characters. my nephew would love this game it look like a really wild and fun game to play! I like the graphics, that you can explore other worlds and more than one can play. This looks like a game my family would love. Looks like something I can play with my grandkids. My daughter LOVES Spyro! She would really enjoy this! Happy holidays! Thanks so much for the fantastic giveaway! it looks fun because it looks like something the whole family can enjoy. My grandsons would love this because it is so interactive. It looks fun because it is so interactive. It has great graphics and I like that it can be played solo or multi-player. 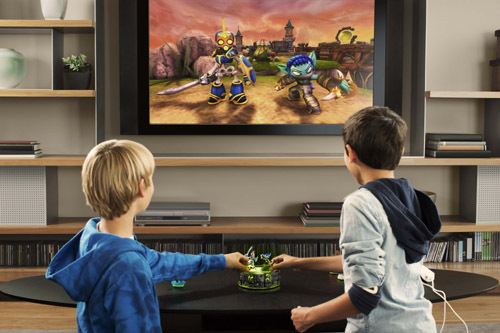 It looks fun because it connect real world toy with onscreen game. 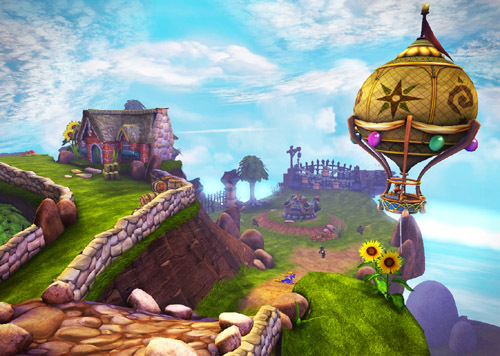 I think it looks fun because it's a spyro game. I love them!